After searching for about 15 years, I was lucky enough to receive a shipment from Japan this week with 3, count 'em *3* new Japanese formats for my Nancy collection. Oh rapturous joy! Two of the formats were ones I had identified long ago but have never managed to acquire (until now!) and the third was an all new entity. I'll post about it in a future segment, as soon as I figure out exactly what the deal is (I need to consult with a Japanese friend first). 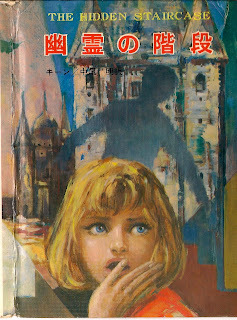 Today I am going to describe the Junior Sekai Mystery aka Poplar format that was published in the late 1960s; I believe there were 5 Nancy Drew titles produced by the publisher (Hidden Staircase, Lilac Inn, Mysterious Letter, Missing Map and Scarlet Slipper). 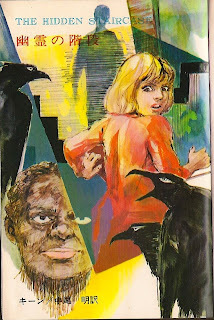 These 5 were part of a series of 20 stories featuring various girl detectives, such as Penny Parker, Vicki Barr and Judy Bolton. I got my hands on Staircase and Slipper and am happy to report that the books are illustrated picture covers with a glossy dust jacket (same artwork as on the cover). There is a colorful title page and then lots of black and white line illustrations scattered throughout the text. The book is quite thick - the spine measures about 1", and there is the cutest spine symbol! 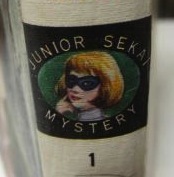 Who is that masked sleuth?? To the right is the dust jacket for Hidden Staircase. As you can see it is original artwork used exclusively by this publisher. 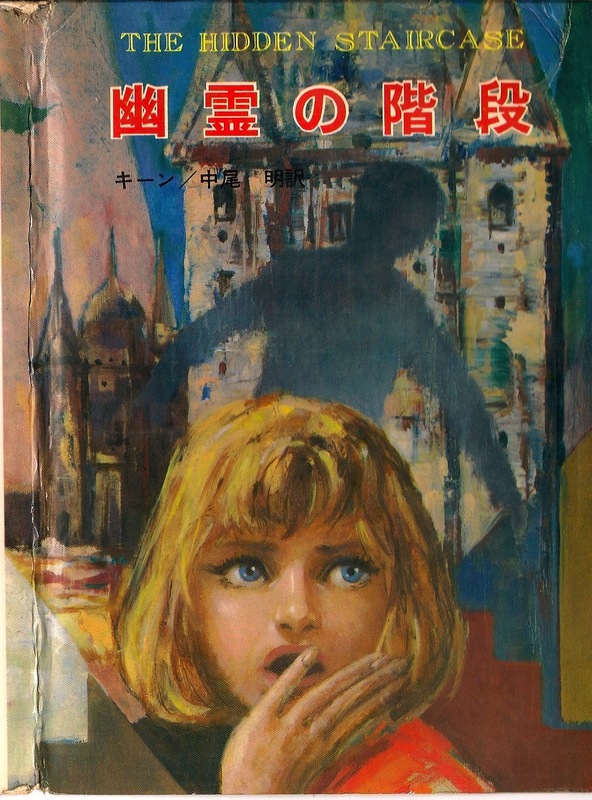 Interestingly it has the English title right above the Japanese version (it translates to stairway of ghost), so there's no doubt that this is a Nancy Drew story. On the left (below) is the title page - the artist is sticking with his shadow motif. I guess the other figure must be the surly "colored woman" that Gombet employs. She doesn't look too much like an ogre to me. And lastly is an example of the line drawing internals - this one is signed "Naka" so maybe that is the artist's name. 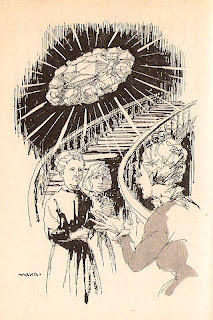 It's the scene where the old ladies are describing their missing jewels.